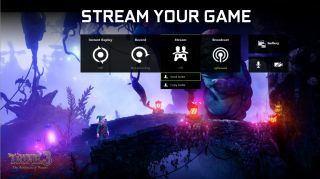 Nvidia has updated its GeForce Experience Beta by adding in screenshot capture and editing, as well as a number of broadcasting features for Twitch and YouTube live streamers. Screenshot capture comes in addition to the existing video capture feature. You can edit and upload your screenshots without leaving the game, and Nvidia has partnered with Imgur to enable image uploading with resolutions up to 4K. In order to do this you'll first need to sign in to your Imgur account or via social media in the GeForce Experience options. Editing options available to you in the software include being able to adjust brightness, contrast, digital vibrancy, and you're also able to crop images. The maximum file upload size is 15MB, but this should be enough for most 3840x2160 screenshots. In addition, you'll now be able to view your recent screenshots and videos in a gallery, where you'll easily be able to select files for sharing and editing. For the live streamers, Nvidia has included the ability to stream with a custom overlay, and there's now an on-screen viewer count which is enabled via an option in the Overlays section of Experience. In order to improve your stream's quality, you can now select your nearest Twitch server to make the most out of your upload speed. The latest update to the GeForce Experience Beta can be found on GeForce's website, where you'll also find all the other minor changes and fixes listed. If you're a streamer, will these features sway you from OBS as the go-to software?